Do you need help choosing the perfect engagement ring for your fiance? How about help finding a perfect anniversary gift? We’ll show you the latest jewelry trends and help you understand exactly what you’re buying. If you have an heirloom diamond to reset, we can help with that, too. Purchasing fine jewelry is one of the most important and expensive purchases of your life — we’ll help you make the best choice. We’ll help you choose an engagement ring that she’ll love and bring you up to date with engagement ring trends to help you when you shop. New baby on the way? We will help you find that perfect gift to commemorate the occasion. Birthdays, Mother’s Day, Christmas… We’ve got you covered! Diamond rings are the number one engagement ring choice, but other gemstones are gaining popularity with brides to be. Use these tools to find and buy the perfect engagement ring. We’ll help you choose an engagement ring that she’ll love and bring you up to date with engagement ring trends to help you when you shop. Your engagement and wedding rings are some of the most important purchases you’ll make in your life. Before you buy them, click here to read buying advice, information on diamonds, how to get great deals, what gemstones to avoid, and more. Browse different fine jewelry options for your wedding bands. Shopping for a particular wedding anniversary? Learn about different types of anniversary jewelry here. Help moms celebrate the gift of life with a timeless piece of fine jewelry. Whether you give an heirloom locket or a diamond band, the options are limitless. Do you know what your birthstone is? What about your daughter’s? Find out about different birthstone options, and get some birthstone jewelry ideas. Whether you a putting a diamond under the Christmas tree or giving a necklace for Sweetest Day, there are many occasions to give the gift of fine jewelry. We’ll show you the latest engagement ring trends and help you understand exactly what you’re buying. An engagement ring may be one of the most important purchases of your life — we’ll help you make the best choice. Budgeting for an Engagement Ring – How Much Should You Spend? How Much Should You Spend on an Engagement Ring – Engagement Ring Budgets: You don’t have to spend a fortune to buy a lovely, high-quality engagement ring. Learn how to juggle stone size, stone quality, and cut to make the most of your budget. Engagement Ring Guide: Information to help you determine a budget and become more knowledgeable about diamonds before you head out to purchase an engagement ring. The best place to start your engagement ring search is by reading our ‘Engagement Ring Advice for Guys,’ an article that helps you begin to understand the variations found in rings of all types, and narrow down the ring that best suits your fiance’s style. After that, get facts about different shapes and cuts of diamonds and other gems, and browse down the remaining sections of this page to become more familiar with the many ways a ring can be designed. Explore engagement ring setting choices. Discover which diamond settings are most durable. Decide which engagement ring settings you think are most attractive. Good advice to help you select an engagement ring. The title is ‘engagement ring settings,’ but the information in the following articles applies to settings for any type of jewelry. Prongs are the most commonly used setting component, but prongs are not all alike, and the differences can affect a ring’s durability and comfort. Browse our setting advice for previews of the huge number of engagement ring designs you’ll encounter when you go shopping. 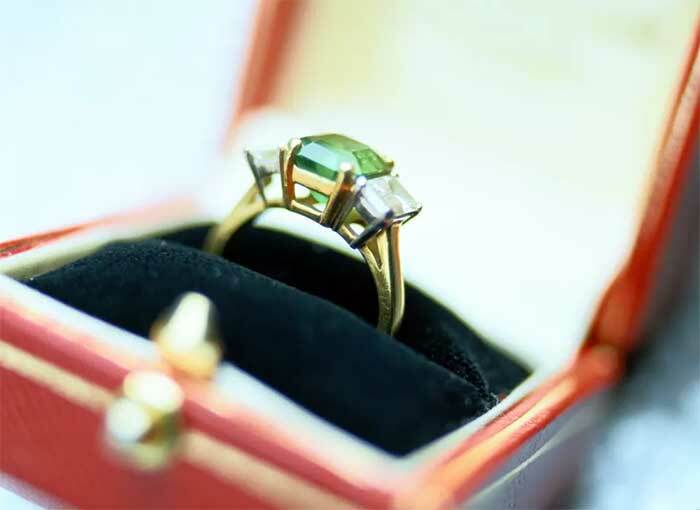 How to Choose a Prong Setting: Prongs are the most common settings used to secure a gemstone in a ring or other piece of jewelry. We’ll help you choose prongs that work with your lifestyle. From trendy to traditional, we’ll help you shop for an engagement ring and other wedding jewelry. Anniversary rings can be used as a special gift, but they make excellent wedding bands, too, and so do eternity rings — with gemstones that encircle the entire band. We’ve included a photo gallery of celebrity engagement rings, too, since celebs help set upcoming trends. Advice to Help You Find and Choose the Perfect Wedding Bands: Tips to help you choose the perfect wedding bands, traditional or contemporary, mass-produced or unique. Includes resources to help you find wedding bands online. Wedding Bands – Go Shopping: Here’s a selection of Web sites to browse if you’re looking for a unique wedding band for the bride or groom. Informative articles about diamond cuts and settings that previous generations preferred for engagement rings. These tips will help you find and buy an antique engagement ring. Guide to Antique Engagement Rings: Circa1930s.com provides information about vintage engagement rings and their care. Bridal Jewelry Through the Ages: A discussion of traditional bridal jewelry and how it has changed throughout time. How To Buy an Antique Diamond Engagement Ring: Details to help you select a vintage engagement ring. Learn what cuts were common in different periods, what metals were used, more. Early Diamond Cuts: Learn how tools and understanding have changed the art of diamond cutting. This article will help you identify earlier diamond cuts. How to Choose an Antique Engagement Ring: An informative feature that helps us understand how stones (mostly diamonds) were chosen and set in the past, plus gives us some direction in selecting a ring. The author also discusses the five C’s for selecting an antique ring (yes, there’s an extra one there).